Can booming video games save Holiday retail sales? Find out from Activision CEO Robert Kotick. The demand for Guitar Hero, the widely popular Activision game now in its third installment, has been “unbelievable,” Kotick said. Guitar Hero sales have been the driving force behind Activistion’s revenues; the game was a major reason the company was able to raise its third quarter outlook and 2008 guidance and is the fastest “$0 to $1 billion” franchise in the history of the video game business, according to Kotick. Guitar Hero’s success has dovetailed almost serendipitously with the Nintendo Wii and X-Box 360 both becoming hits with U.S. consumers. Kotick said the demand from the Wii in particular has been so high that Activision is having trouble keeping up with it on the supply side. The game and systems had a huge jump in sales after the airing on South Park from Comedy Central.The kids of South Park turned into rock and roll stars along with all the trouble that come along with fame. 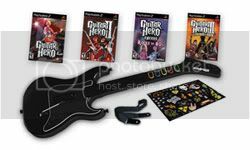 Guitar Hero is produced in versions for Wii , XBOX and Playstation3 . With the shortage of games with the guitar controller has had most stores reporting being sold out by December 1st.